Join the conversation on film and insider stories about some of Hollywood’s greatest stars with New York Times bestselling author Scott Eyman, interviewed by Boca magazine editor Marie Speed. Scott Eyman, the former literary and art critic for The Palm Beach Post, has authored 15 books, including the NYT Bestseller “John Wayne: The Life and Legend,” and two NYT Bestsellers with veteran actor Robert Wagner: “You Must Remember This” and “Pieces of My Heart.” His journalism and criticism work made him a Pulitzer Prize finalist. Scott has also written for The New York Times, the Washington Post, and the Chicago Tribune, as well as practically every film magazine. Boca magazine is thrilled to partner with the Arts Garage in Delray Beach as the venue for this BOCA Chats event. Doors open at 6:00 p.m. to enjoy light bites & refreshments. Chat starts at 6:30 p.m. followed by a Q&A. Thursday, April 26-Sunday, April 30: 2018 TCM Film Festival — Scott will be a featured guest at the TCM fest, participating in a panel discussion at the TCM Club, as well as introducing some films. There will be a book signing after the discussion. Thursday, May 24-Sunday, May 29: Cinevent 2018 — Scott will be a featured guest at the 50th Cinevent in Columbus, Ohio. He attended most years of this festival, and is looking forward to celebrating its half-century mark. Great films, great classic film fans and terrific venue. He will have a book signing there. Here’s a link to a wonderful profile of Scott, written by Ron Hayes for the “Florida Weekly” newspaper. Gear up for Scott Eyman appearances in New York City this weekend! Scott will be at NYC’s Film Forum, introducing films starring Henry Fonda and Jimmy Stewart this coming weekend, Oct. 27-29. Check the schedule for specific appearances, stop by, say Hey, buy a book and watch a great film! Here’s the schedule – the films run Oct. 29-Nov. 16! “Hank & Jim” publishes this week! Lone Pine Film Festival features Scott Eyman as Keynote Speaker! Get your cowboy hats, boots and spurs to head over to the Lone Pine Film Festival that celebrates the wonderful film genre of the Western! From Oct. 6-8, in Lone Pine, Calif., hundreds of fans converge on this area used as a backdrop to all kinds of Westerns for decades. You’ll see places where Hopalong Cassidy films were made, where John Ford and John Wayne made their films, where TV shows Gunsmoke, Rawhide, Rifleman and Have Gun Will Travel were filmed. Tours of these sites are offered, and films are shown all the time, and then there are the panel discussions with all kinds of experts (Scott included) and actors. As a bonus, Scott will be signing copies of his new book, Hank & Jim (Simon & Schuster), about the 50-year friendship between Henry Fonda and Jimmy Stewart. The festival will have these for sale before any bookstores! We hope to see Western fans there! Scott is honored to be included again this year in the 24th Buster Keaton Celebration taking place in Iola, Kansas, Sept. 29 & 30. With the great price of a $20 per person registration fee, and free evening screenings, this festival celebrates one of the most honored American film comedians of all time. Special guests this year are: Melissa Talmadge Cox, Buster’s granddaughter; Barbara Talmadge, Buster’s daughter-in-law; Harry Keaton, Buster’s nephew; and Paul Gierucki, a motion picture producer, writer, film historian and preservationist. Also joining Scott as guests are Robert Arkus and John Tibbets, with musical guests Marvin Faulwell, Ben Model and Jeff Rapsis. Fans from all over the world (literally!) attend this event, and we hope to see some of you there. Please stop and say Hi to Scott if you attend! During the two-day celebration, there are many films – both silent and talkies – shown, the silents with live accompaniment. There are panels discussing all kinds of topics, including one with the Keaton family members discussing Buster and his family life. Scott will be at Cinevent 2017 over Memorial Day weekend, May 25-28, 2017. He will be signing books during the convention, but you’ll probably have better luck finding him in the trading room! Hope to see you there. TCM Classic Cruise – Join Scott for the last TCM Cruise! From Nov. 12-19, 2016, Scott Eyman will be on board the last TCM Classic Cruise, along with Leslie Caron, Kim Novak, Jerry Lewis, Diane Baker, Mitzi Gaynor and more wonderful folks! The cruise stops in San Juan, St. Maarten and on Disney’s own Castaway Cay. The ship is the large Disney Fantasy, and there are non-stop films, interviews, Q/A with the audiences, special displays, great music and a chance to talk with hundreds of like-minded, classic film lovers. Scott has been on four of the past five cruises, and thinks the interaction with fellow passengers is the best anywhere. The Disney ships are beautiful, with terrific staff and accommodations. And yes, there are still cabins left. Join Scott in honoring Buster Keaton at the Annual Buster Keaton Celebration! Scott will be one of the guest speakers for this year’s Annual Buster Keaton Celebration in Iola, Kansas. It’s a beautiful town, with a gorgeous theater/center, and lots of enthusiastic, interesting Keaton fans meet here each year. Dates are Sept. 23-24, 2016, and Scott will be talking about Buster Keaton and the Landscape of the West. Admission is $20, and we hope to see some fans there. In April, along with the John Wayne paperback being issued, Simon & Schuster is reissuing nicely designed paperbacks of three other Scott Eyman books. 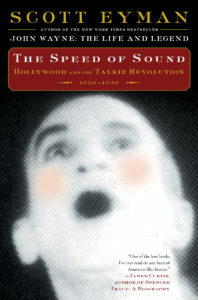 Look for Ernst Lubitsch: Laughter in Paradise; Print the Legend: The Life and Times of John Ford, and Speed of Sound: Hollywood and the Talkie Revolution 1926-1930. On stage at the 2015 TCM Film Festival! Scott interviewed Peter Fonda on stage at the 2015 TCM Classic Film Festival in Los Angeles, March 27-29th. They chatted about Peter’s father, Henry Fonda, on the 100th anniversary year of Henry’s birth, in the TCM Club at the Roosevelt Hotel. Scott will introduced Young Mr. Lincoln, with Peter Fonda, on Friday, March 27. On Saturday, Scott introduced They Were Expendable, a John Wayne/John Ford film. He also had a book signing in the Roosevelt Hotel, with support from Larry Edmunds Bookshop. NATIONAL BOARD OF REVIEW FILM HISTORY AWARD! Scott has received the 2014 William K. Everson Film History Award given by the National Board of Review, for his body of work. The awards ceremony and dinner (a red carpet affair!) was Jan. 6, 2015, in New York City. Also attending and receiving film awards were: Clint Eastwood (Best Director), Michael Keaton (Best Actor), Julienne Moore (Best Actress), Edward Norton (Best Supporting Actor) and Chris Rock (Spotlight Award). NOV. 7, 2014 – Scott appeared at a fundraiser for the Society of the Four Arts, in Palm Beach. NOV. 5, 2014 – Scott spoke to a capacity crowd at the Mandel Public Library of West Palm Beach about his John Wayne book, and signed books, too. Scott was a featured speaker at the Florida Heritage Book Festival in St. Augustine, Fl., on Saturday, Sept. 27th. The film series started March 20, and then each Thursday evening (except April 10) at 6:30 through April 17, the program includes John Cassavetes’ “Faces,” Shirley Clarke’s “Portrait of Jason,” D.A. Pennebaker’s “Don’t Look Back,” as well as films by Warhol. Stay tuned for Scott presenting another film series in 2015! — Saturday, April 5: Scott appeared at the San Antonio Book Festival, and was interviewed at 11 a.m. by moderator Jim Mendiola. He signed books immediately after the interview. — Sunday, April 13: Scott was at the Los Angeles Times Festival of Books. He was on a “Biography: Hollywood Legends” panel discussion on April 13, at 12:30 p.m. There was a book signing immediately following the panel, and he joined the Mysterious Galaxy Booth Signing at 3 p.m. that day, too. — Monday, April 14: Scott was at the Larry Edmunds Bookshop at 6644 Hollywood Boulevard, at 7 p.m.
— Tuesday, April 15: Scott was a guest at the San Marino Friends of Crowell Public Library series, starting at 7 p.m. He spoke about his John Wayne biography, and then signed books. —May 23-24: He was a featured speaker at the John Wayne festival in Winterset, Iowa. — He appeared at the John Ford festival in Dublin, Ireland, in June. I am Carey Reed, the membership director at the Palm Beach Yacht Club. Along with my membership duties, I love locating speakers for our “Lunch and Learn” series during our season. Our speakers are professionals in their fields who talk to our members for 20 to 30 minutes about their area of expertise. Lunch is then served followed by an interactive question and answer period. Our members are wealthy, well-educated and well-traveled. They love excellent food and service and are naturally curious and interactive with our “Lunch and Learn” speaker. For an article I am writing for the New York Times about football hoaxes, I would appreciate being able to talk to Scott Eyman. I very much enjoyed talking with you on the cruise several times and you signed four of your books for me. Thank you so much. One topic I wanted to discuss was the almost strange effect watching Cecil B. DeMille’s films have on me. I program movies at the West Seattle Senior Center two days a week and I scheduled DeMille’s, “Samson and Delilah about eight months ago. I think DeMille was doing things in the frame(it is stuffed most of the time) and with his editing that affects the subconsious. The feeling I definitely had after watching it was that there was far more to the movie than met the eye. Keep writing your wonderful books. I just finished reading your silent to sound treatment and it was so enjoyable, I thought it was too short. Out of the six I have read, the DeMille biography is the best because of the history and philosofy and religious scope that is there. Don Perkins on Welcome to ScottEyman.com! Fritz Groszkruger on Welcome to ScottEyman.com!